They say the kitchen is the heart of the home – it’s where meals are lovingly prepared for the family, where adventurous culinary experiments take place with friends, where long days are hashed out with loved ones, and where one sneaks off to for a midnight snack. 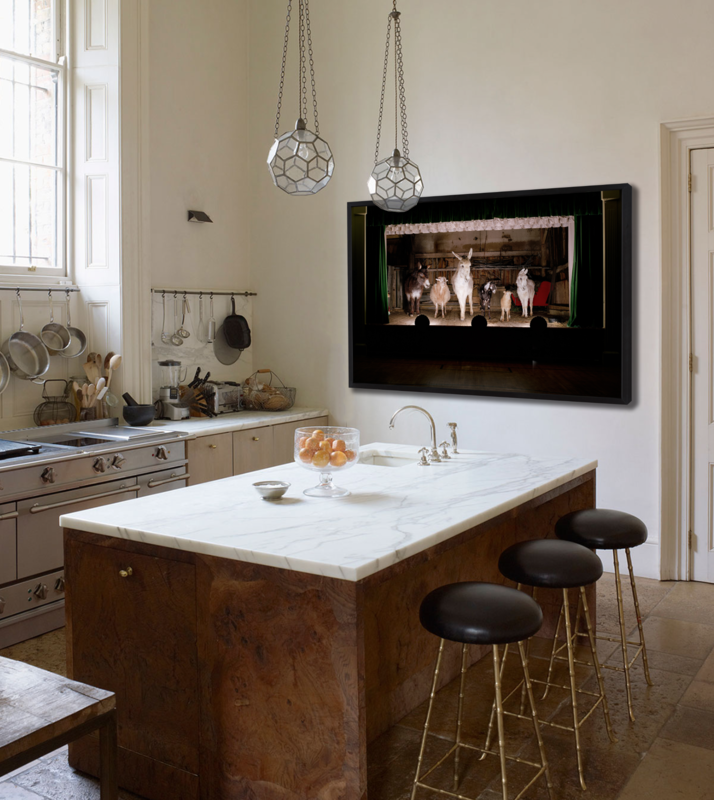 The kitchen is central to so many life experiences, which is why it is the perfect place to display a gorgeous, commanding piece of art – with a little imagination, your kitchen can be completely revitalized. Go ahead and delve into these three selected rooms that showcase the power of bringing art into the kitchen. MacInnis, “Opening Night,” Photograph on Paper, 40 x 62 in. Robert MacInnis’ “Opening Night” is filled with drama and a touch of humor, making it an instant focal point in this warm kitchen. Set behind a beautiful marble-slab island alongside rich tones of chestnut and ivory, MacInnis creates an immediate dialogue between the subjects of this piece and the inhabitants of the space. The animals playfully stand watching as one prepares food below, the intense spotlight lighting introducing a theatrical and whimsical quality to this interior. Abrecht, “Sienna Pass I,” Oil on Canvas, 36 x 60 in. Placing “Sienna Pass I,” by Eric Abrecht, above the sink is a brilliant way to introduce warmth into this pristine, crisp white interior. Positioning this soft, serene landscape in between two large picture windows creates a seamless view of beautiful hills and trees set beneath soothing skies. The washes of burnt sienna and yellow ochre echo throughout this interior, bringing together the worn leather and natural wood details among the glossy white surfaces. Anke, “Blue Arrow,” Mixed Media on Panel, 60 x 60 x 2.75 in. Bring bold, striking color into the kitchen through large, breathtaking works of art. 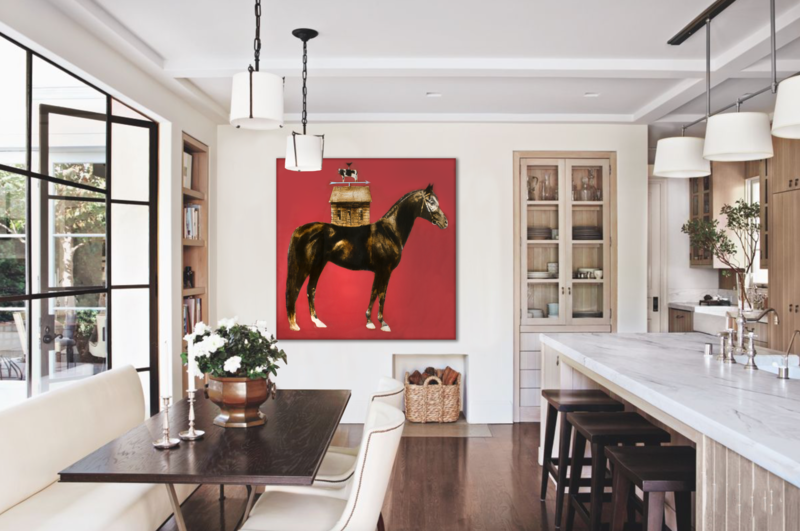 “Blue Arrow” by Anke commands immediate attention in this serene kitchen with its brilliant red background and prominent, stoic horse. Anke’s whimsical composition brings a powerful element of play into this setting, revitalizing the surfaces of this interior through its vibrant, saturated colors.